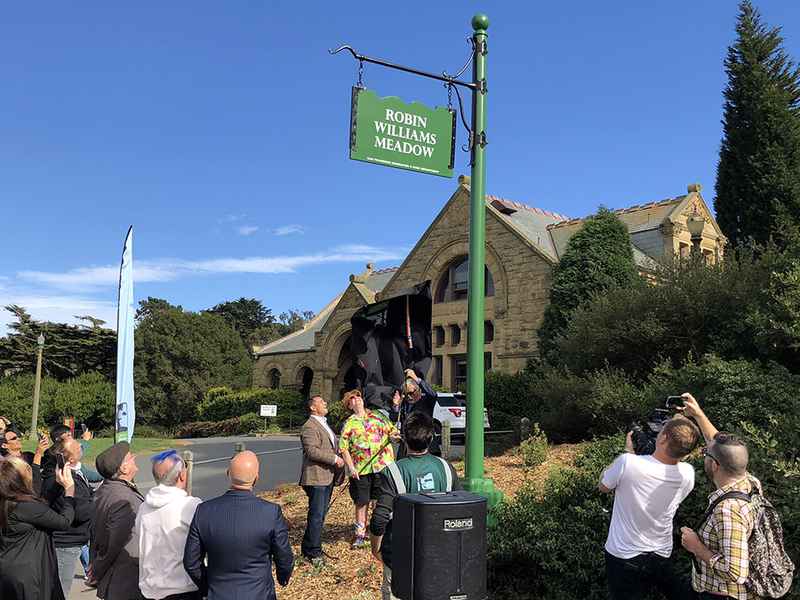 On Friday afternoon, comedians and Recreation & Park officials gathered in the southeastern corner of Golden Gate Park to unveil a sign renaming Sharon Meadow as Robin Williams Meadow -- just in time for Sunday's Comedy Day event there. 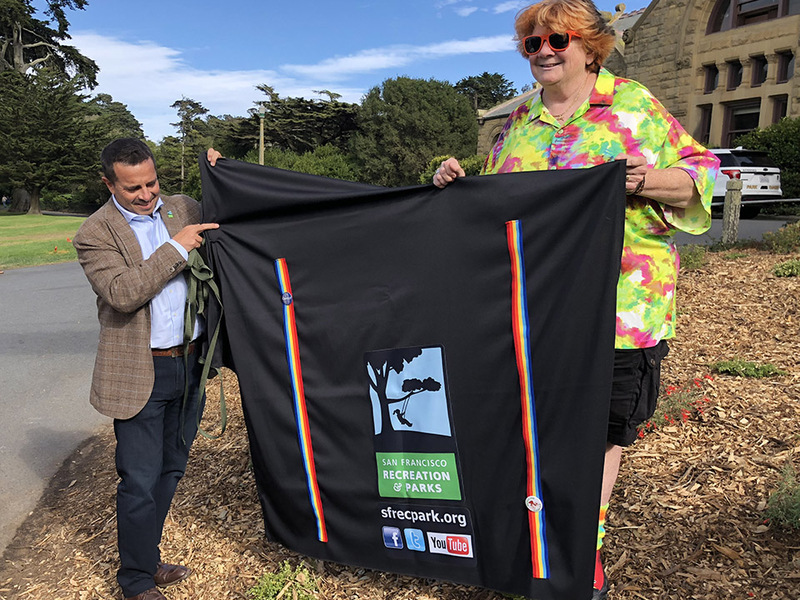 Last December, the Recreation & Park Commission unanimously approved the decision by late Mayor Ed Lee to name the meadow after the renowned actor and comedian, who passed away in 2014. Its previous moniker came from its proximity to the Sharon Building, which is named for banker and Nevada Senator William Sharon. 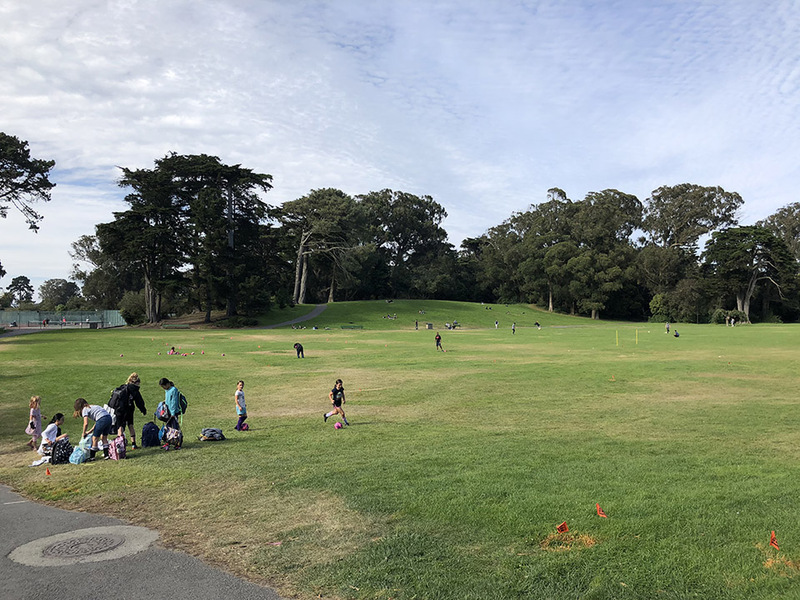 Williams, whose family moved to Marin County when he was in his teens, got his start doing stand-up in San Francisco, and was a familiar face around town until his passing. He was also a longtime financial supporter of (and sometimes performer at) the annual free Comedy Day event held in the meadow. The name change had already appeared on Google and Apple Maps, but this was the first time the meadow received signage indicating its new moniker. "The renaming is a really good thing to do," said Rec & Park general manager Phil Ginsburg at the ceremony. Phil Ginsburg and Debi Durst. Debi Durst, who has co-organized Comedy Day for nearly four decades, spearheaded the effort to rename the area. Durst said that no records indicated that the meadow was officially named after Senator Sharon, so technically they were "naming it, not renaming it." Steve Kawa, Lee's former chief of staff, said during Friday's event that as soon as he brought the idea to Lee, the mayor made a few jokes and then exclaimed that he thought it was an absolutely perfect idea. Now, it's also a part of Lee's legacy. During Friday's gathering, friends and officials mentioned Williams' openness and how easy it was for everyone to approach him. Rec & Park president Mark Buell said that on every occasion that he encountered Williams, he always left with one thought: "He has a huge heart."